In t-ball with regard to fielding, the number one goal is not to catch the ball. The number one goal is we want develop confidence and try not have the player get hurt by the ball hitting them or making them afraid of the ball. There are different stages for a youth player to learn how to catch a ball. In the early stages of a youngster’s life, he will catch a kick ball or a large plastic ball by cradling it against his body. Kids develop their motor skills at different ages and some might develop them very young. Others may develop them later on. A youngster can be as old 8 or 9 when he or she first becomes comfortable catching a ball with their hands. There are numerous factors that go into this. Besides the development of the motor skills, a big factor is if the youngster has an older brother or sister who plays baseball or softball. Kids that practice with their older peers may have an advantage because of the added repetitions they are getting. Whatever the reason for this development, the kids themselves will not mind that much because another player can catch a fly ball and they can’t. What you have to do as coach is to explain to the parents how each player develops at a different pace and not to feel self conscious if their own kids look like they lack talent at 5, 6 or 7 years of age. In our overly competitive society, many parents cannot accept that another child can throw or hit a ball better than their own child. I have seen youngsters who looked awkward and clumsy at a young age in a sport and end up becoming All County in high school in that sport. I have also seen kids who I thought would never amount to anything in life become very successful. I remember one youngster who was the biggest pain in the neck on my team as a eleven and twelve year old. I never thought he would amount to anything. I met him in my town about twenty years later when he stopped me. I was shocked for two reasons. The first was that he was coaching his son’s baseball team because of me. And the second was he had just become one of the youngest judges in our state. So we are all guilty of pre-judging people. And parents sensitivity with their own kid’s ability at anything can get out of hand. So beware and keep your parents calm if they seem upset at their own kids. And when it comes to the fielding skill itself we as youth coaches have to put the t-ball players in the best position to succeed. I have repeated this over and over again, but it drives me crazy when a first year t-ball coach will begin his practice throwing fly balls to his players. This is the best way to turn a youngster away from baseball if he gets hit in the head with one of the very first balls thrown to him. In athletics, there is term used called the “Specificity Principle.” The meaning of this term is for athletes who want to become better at a certain skills, they should practice that specific skill. A shot put thrower will get better tossing the shot put rather than only lifting weights. A basketball player who wants to improve his foul shooting is best served practicing his foul shots instead of shooting from the corners or only practicing visual training. In t-ball the developmental stage is so young and raw that coaches and parents need to think things out. When I speak about reachable goals, if the goal is not to catch the ball but only to make contact with it with your glove, doesn’t this make more sense at your first practice? Can’t we progress from this point? And if you agree that some kids develop differently, how about dividing the team in half with the more developed kids in one group and the rest in the other group. We want to practice as much as we can as a team but we want to be fair to the different levels of skill at this young age. So yes, I agree with the specificity principle, but t-ball coaches have to think outside the box for the betterment of the whole team. In Major League baseball, when there is error in the infield on a ground ball hit directly at the player, most of the time it is because the infielder lifts his head up a fraction of a second too soon and the ball goes under his glove. This happens a lot when the infielder is rushing to make a double play. Like a receiver in football running before he catches the ball, the shortstop in his haste to get two outs gets none as the ball embarrassingly trickles underneath his glove. In t-ball the concept of just stopping the ball and keeping it front of the player should be emphasized. Of course we want the player to catch the ball cleanly and make a perfect throw to first base, but just looking at some of the gloves the parents bought their kids makes it almost impossible to catch a ground ball clean. Ideally on a ground ball the player will move his feet to wherever the ball is. He will field it in the center of his body, with his glove out in front of his body forming almost a triangle with both feet. He bends the legs by bending his knees, not just bending down from the waist. He watches the ball go into his glove then brings the ball up to his waist then chest and throws it to first base for the putout. Oh, if life was so easy! For kids in t-ball make sure you separate skills when practicing. If you are practicing ground balls, don’t have them catch a ground ball and throw it right back. Have them catch a ground ball and carry it with them back to the end of the line or catch the ground ball and just drop it to the side. This simplistic idea works well having young t-ball players focus on one skill. You can and should eventually combine more than one skill but the initial teaching of the skill should be that skill and that skill only. An excellent drill is the “No Glove” drill where you throw ground balls and the player moves to catch it in the center and in front of his body with both hands open. I use this drill for older kids because sometimes players think just because they have a $150.00 glove on, the ball will automatically go into it cleanly. An excellent term I use which came from a close friend of mine, hitting instructor Bobby Woods is the term “soft knees.” This is one of those terms you can use to help kids get used to bending from the knees and they will remember it! Catching a fly ball in t-ball is a rarity but during the course of a season, players may catch a fly ball cleanly. I recommend you start by just having the players make contact with their glove and the ball. And state to the team that no one is aloud to catch the ball. This way they all have the same goal. more advanced players may be bored but they should be able to go through this for one or two practices. Another technique I have used with t-ball players is one of those scatch paddles with a scatch ball. The ball has a couple of Velcro strips and they will automatically stick to the paddle. You may ask, Is this teaching a real baseball skill? I would answer that anything you do to give a 4, 5 or 6 year old confidence with fly balls should be tried. When you transition to the glove from the paddle, the player has a better chance to make the catch. Another suggestion is to use a racquet ball racquet and tennis balls. These are hard to catch with a baseball glove and always seem to bounce out. But if you use the “just make contact” goal here for everyone, it works and the players love seeing and using props. Also if you are a coach or parent having a catch with your son or daughter in t-ball, many parents tend to throw the ball underhand and the player is standing there with the glove open facing the sky. I think this is the wrong way to teach catching balls in the air. The ball can easily roll or bounce up right into the player’s chin and we just helped the lacrosse and soccer coach recruit another player. When the thrown ball approaches a youngster from the waist up, you want the fingers facing the sky. Again the quality and condition of the glove will play a big part in the success of the player catching the ball. Just as I mentioned the “No Glove” drill for grounders, using rag balls or even bean bags with a player’s bare hand is an excellent way to teach kids to catch fly balls. The coach tosses the bean bag to either side of the t-ball player and he only has to make contact or block it. And going from side to side is important because youngsters are not used to their own hand blocking their vision with their hand going in front of their eyes. Remember we want to develop confidence and not to hurt players or make them afraid of the ball. 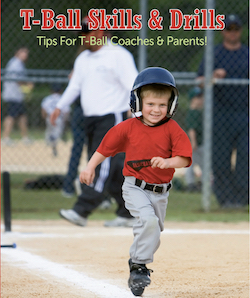 All of Marty Schupak tee ball books and videos are available at Amazon.